Each day we have had a few choices of which route to walk on, towards our next destination. Today in consideration of my tired feet, we chose the somewhat shorter and more direct route, that runs along Route 55. It is the first of three days it will take to cross into Kochi Prefecture and reach the next temple on our pilgrimage, at the southern tip of Muroto peninsula. 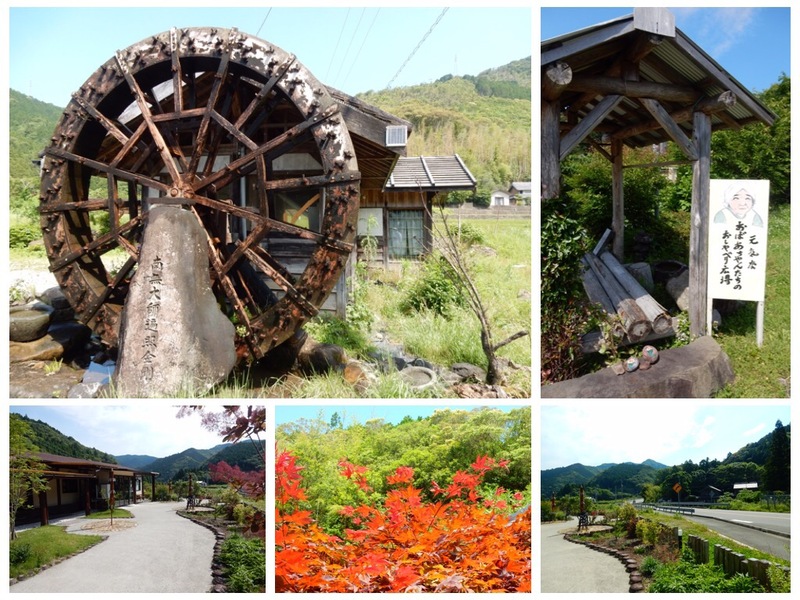 Kochi prefecture symbolizes the “Discipline and Asceticism” part of our journey towards enlightenment, with long walks and little services or places to stay. My feet had recovered somewhat from the walk of the previous day, and I was feeling pretty “genki” (strong) when we started the day. But the powerful sun, and walking on hot asphalt for hours, started to take their toll, and my feet started throbbing. I had had enough by the 20th kilometer, but I had to make it an extra five kilometers to reach the conclusion of the day’s walk, the Bengai temple, Saba Daishi. A Bengai temple is one of the twenty temples on Shikoku Island which have significant ties to Kobo Daishi, but are not part of the 88 Temple pilgrimage. Blisters were forming on my right foot. The surprising thing is, that the only part of my body that feels fatigued right now, are my feet. As a hiker, I NEVER get blisters, but as a swimmer, I used to get leg cramps. On this pilgrimage, I no longer have any sore leg muscles, my back is doing great and there is no leg cramping, only my feet are hurting and tired. I stopped at as many rest areas as I could during the day, to rest my feet. We passed by Mugi town and even though there were a handful of Ramen noodles places to eat, we did not go in. The Ramen is always made with pork broth, so instead we bought fresh salads at the 7-Eleven and sat on a bench in the shade to eat them. In another rest area, we met three ladies who were volunteering to help feed and support passing pilgrims. Today we did not see any pilgrims in either direction, which leads us to think that less committed pilgrims, were taking the bus to avoid the long stretches of walking in the sun, with no temples and almost no services. The ladies in the rest area gave us cold unsweetened ice green tea, roasted sweet potatoes, rice crackers and hard candy. They were so encouraging and their good hearts were overflowing with kindness. They have taken time out of their busy lives to be of service to Henros, setting a wonderful example of selfless giving to our brothers and sisters. Their hospitality, combined with my throbbing feet, made me feel like crying. How good people are……and how frail is my human form. I wish to be stronger, yet at times, I feel so small….. There were no temples to visit today, but we did stop at a temple called Saba Daishi to pay our respects. Saba is the Japanese word for Mackerel fish. The story is that Kobo Daishi (in the 800’s) met a dried Mackerel seller on the road. He was hungry, and he asked the trader to spare a dried fish. The trader thought that Kobo Daishi was a beggar, and he refused. He said that it is his livelihood, and that he cannot give all of his supplies away. A bit later the man’s horse got very sick. The trader realized that the beggar was the famous but humble Kobo Daishi, and he ran down the trail to ask Kobo Daishi for his forgiveness. Kobo Daishi forgave him and healed his horse. The man insisted that Kobo Daishi eat one of his mackerel. Kobo Daishi ate the dried Mackerel and then excreted the fish, fully alive. This temple is not one of the 88 temples on the pilgrimage, but it is one of the extra twenty temples that were informally added in later years, to make 108 temples. 108 is the number of beads in the Buddhist rosary. The beads symbolize the 108 human faults that we need to correct or to overcome, in order to free ourselves from the sufferings of this world. We booked the Riviera Onsen Hotel in the town of Shishikui, about 7km from Saba Daishi Temple. We took a rural, one-car railroad to cover these final 7 km. The hotel sits right on the ocean, and the sound of the waves was very soothing to me. Our room faces the ocean and is not Japanese style, which means that it has beds and furniture. It actually looks like many ocean front hotel rooms in Florida. It has pastel colored furniture, carpet and curtains. We did not book their half board deal, because we did not feel like eating a twenty course meal of mostly fish. Instead, we bought in the local grocery shop some cherries, strawberries, kumquats, grapes, cherry tomatoes, a local melon and a package of very fresh local sashimi. The Onsen might have been glorious at one time. It has a cypress bath which is made entirely from cypress wood, and very soft feeling hot-spring water. But nowadays it is a bit worn both on the inside and the outside. You can see areas where the sea salt has caused the paint to peel and the concrete to start corroding. The Onsen is large and used by many of the locals who live around town. There are also many surfers who stay here during the summer months, to take advantage of the beautiful breaking waves along a picturesque stretch of beach. Beside the cypress bath, there was a very large marble bath overlooking the ocean. Like all Onsens, men and women have separate baths and you are NOT allowed to wear bathing suits. The women I met in the Onsen were both curious and very friendly towards me. One women came over to help me “Navigate” the hot water taps, and almost burnt me by turning on the hot water too much. I did not need help with the faucet, but I was touched by her caring and felt that it was a sign that I was not too guarded, that people felt comfortable coming over to me to start a conversation so easily. The very hot water made me feel tender and raw…. I felt like crying, although I was not sure why…. Maybe it was the blisters on my feet or the hardship…. Maybe I just needed to vent…. Maybe it was because I felt saddened by our mortal limitations…. The beautiful woman with breast cancer who told me that she had once honeymooned in Hawaii…. The old shriveled woman who unashamedly followed me around, wanting to see and learn why I look so young, even though I am obviously an older woman…. She watched my every move and said that I look so young and so beautiful…. I felt like crying from their kindness and my pain, but tears did not come out. Instead, I soaked for a very long time, laid on the hard marble and elevated my feet up the wall. I thanked my feet for doing so much for me and imagined them surrounded and pulsating with a bright light. Later in the room, I rubbed my feet with a mixture of my facial cream and essential oils. I brought no other cream, but the next time we are in a city, I will buy a foot cream. In our hotel room, we had a table and chairs, so we laid out our fruit and had a feast. Unfortunately, while I peeled and halved the local melon that I had bought to remove its seeds in the bathroom, it slipped out of my hand and fell straight into the toilet. So I won’t be able to report how the local melons taste! Normally I am very coordinated and precise in my movements. It comes from years of practicing meditation and yoga. You are not supposed to make too many clumsy moves, but to be efficient in your movements, get up in one swoop, be balanced and aware of your core. But now, with my waddling around like Charlie Chaplin, the melon slipping out of my hand and falling into the toilet, I felt very comical. The sound of the waves lulled me to sleep and I woke up to a pinkish red Universe which quickly turned yellow, and later the sky turned a gentle blue. Tonight we will stay only eight kilometers south of this hotel, in the small surf town of Kannoura, because the next day we have more than twenty six kilometers to walk, and then the day after we will reach Cape Muroto and Temple 24. I wish we could divide the walk more evenly, but there are no places to stay midway, so we have to adapt to how far it is possible for us to walk each day. Because we do not have a Japanese mobile phone and we have very basic language skills, we asked the very friendly person at the front desk of our hotel, to help us with booking the next three nights’ reservations. Our Japanese SIM cards came with only data, no phone plan. To add a phone calling plan, we needed to be residents with a residency card, and to sign a year long contract. The other option was to rent an iPhone at the airport, but we arrived at the airport so late and everything was closed, so we decided that when we do need to make phone calls, we will ask our brothers and sisters on this earth, for help. We will use this short walking day to get Jules a haircut and to rest my precious and wonderful feet for our next walk. Jules writes: I just keep on walking…not to anywhere on this world, but to be absorbed into the eternal. It is no wonder that Kochi is the prefecture symbolizing sacrifice and asceticism on this pilgrimage to enlightenment. The sun is hot, and the path is difficult, but NO ONE fails who earnestly seeks enlightenment….